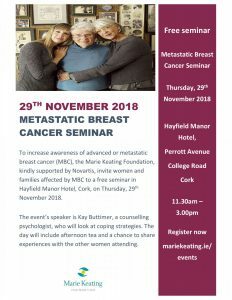 To increase awareness of advanced or metastatic breast cancer (MBC), the Marie Keating Foundation, kindly supported by Novartis, is inviting women and families affected by MBC to a free seminar in Hayfield Manor Hotel, Cork City, on Thursday 29th November 2018. The event’s speaker is Kay Buttimer, a counselling psychologist, who will look at coping strategies. The day will include afternoon tea and a chance to share experiences with the other women attending.